The tournaments Topbetta run are what makes this bookmaker unique. The tournaments can run over a single race meeting, sporting competition or it can across several meetings or weeks of a competition. This means theoretically you can run a tournament with all the races from the unnofical ‘Day 3’ of The Championship at Randwick and the Golden Easter Egg greyhound meeting, to be held on the same weekend at Wentworth Park. The tournaments can vary from free, for those who just want to have fun, to high stakes, with every category of punter catered for. The first stage of setting up a Topbetta tournament is opening an account, otherwise read on, to find out more about this great initiative. As previously mentioned the first stage is signing up at Topbetta, if you want to learn more about it, read our full review of the bookmaker here. Once you have signed up you need to login to your account and click the tournament tab, which is on the far left of the top menu. From here you will see all the different tournaments on offer, with these ranging from racing to various sports events. You will see they have different buy-in amounts, ranging from free to bigger amounts, in the thousands. This means you have to fund your Topbetta account before you can enter them. After you have signed up for a tournament you will be given BettaBucks to bet with. The amount you will be given will depend on how much the specific tournament cost to enter. The tournament console clearly shows how much you have bet or turned over, and how much more you need to turn it over before you qualify to ‘win’ the tournament. 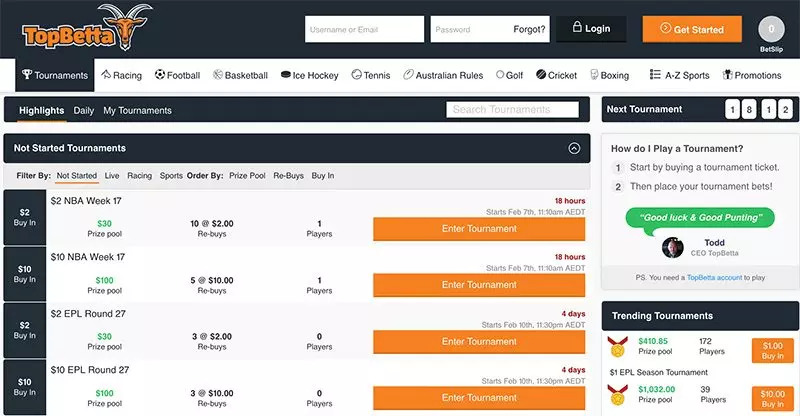 You can bet as little, or as many BettaBucks as you like on each race or match, which allows you to spread your wagering over many events in the tournament. After you have placed your initial wagers you wait for the result of the event you placed it on. You can then check the leaderboard which will tell you how you are travelling in the event. This is the time when you determine if you should bet in the tournament again, or sit on the lead you have developed in the tournament. For instance if you are in a racing tournament and you have booted home a long shot winner in the first bet, which has got you sitting pretty at the top of the leaderboard, you might be better off sitting on the score, rather than frittering away your Topbetta points on more bets. Remember there is no benefit in scoring more points once you can’t be beaten in a tournament, your goal is to beat the other people in it, rather than continually backing winners. The two categories of tournaments at TopBetta are ‘Sport’ and ‘Racing’ with some of them working like a poker satellite. For the uninitiated that means you play in a tournament with the winner, or a certain amount of leaders, qualify for a tournament worth more. This means you could enter a $10 racing tournament, with the winner qualifying for a $200 or $500 tournament the following Saturday, giving you a chance to win a big bounty. Other tournament work under a winner takes all philosophy, meaning the leader at the end of the tournament gets all the pool, minus the betting company’s take. Some other tournaments might work on a top three basis, so if you enter the tournament and there are 50 participants who have paid up, the pool will be split between the three leaders on a sliding scale. The tournament structures are not overly complicated but it definitely pays to do your homework and know how your specific tournaments works before committing to it. This means you can enter a tournament more than once if you are knocked out. The only caveat on this might be, for instance, if the deadline for re-buys has passed. Usually if it’s a racing tournament the deadline might be after race five or four, depending on how many races there are on the card. Other tournaments based around sports might cut re-buys off half-way through the round, for instance if it was an AFL tournament you may no longer be able to buy back in after the Saturday afternoon games, which is generally around half way through the round. The rebuy costs is usually the same amount you paid to get into the tournament.